With the designer's brief of Queensland fauna, I have created five majestic 'Merinos Couchant' and two cranky 'Cane Toads' for this pool area. Shown to the left is a detail photo of the original Merino sculpture in clay. 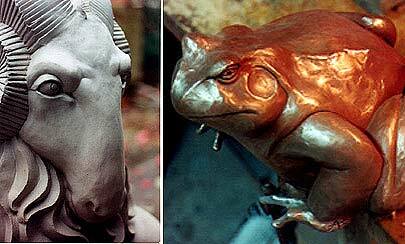 Next to him is one of the Cane Toads, polished and ready to be patinated.